Regular back stretching elongates the muscles in the back and improves posture. You were so proud when you finally started growing as a child. Now, with the use of heels, you may have even accepted your final height. However, a recent trip to the doctor's office confirmed your fear. You are shrinking. Or maybe you're just not standing up straight. For many women, both may be true. Poor posture, osteoporosis and low bone density contribute to a loss of height. Luckily, regular stretching and strengthening exercises help to increase bone density, strengthen the muscles in the back and reduce the risk of osteoporosis and shrinking in the spine. While the risk of osteoporosis is greater in women, it can occur in men. According to the National Institutes of Health's Osteoporosis and Related Bone Diseases National Resource Center, more than 40 million people are diagnosed or at risk of osteoporosis. Your bones are a living tissue. As you grow, new bone tissue replaces old tissue. Unfortunately, as you age, the body does not replace the old tissue as quickly as it is lost. Because of this, bone density decreases. Osteoporosis in the spine causes the vertebra to collapse and increases the risk of compression fractures. This collapse is what results in a loss of height. Bone, like muscle, responds to exercise by growing stronger. Another common cause of height loss as you age, as well as a symptom of osteoporosis, is poor posture. Years of sitting hunched over at a desk can take their toll. Back stretching exercises target the muscles of the back which increases flexibility and range of motion in the joints. Supermans are a basic back stretch exercise. Lie on your stomach with your legs extended. Stretch your arms above your head with the palms facing together. Make sure your neck and head line up with your spine. As you exhale, slowly lift both legs and both arms off the floor. You should feel the muscles in your back stretching and elongating. As you inhale, slowly return to the starting position. Other back stretches include the 90 lat stretch, child’s pose, inchworms and the glute bridge. Stability balls offer an additional tool for back stretching exercises. Because they require you to maintain balance, activation of the core muscles occurs. In this way, a basic stretch for the back targets more muscles that help to support the back and promote good posture. The stability ball reverse extension is an example. Begin with your torso resting on the ball with your hands touching the floor on one side and your toes touching the floor on the other. Your abdominal muscles should be resting on the ball’s surface. As you exhale, walk your hands forward until your hips rest at the top of the ball. With your feet together, slowly lift your legs up so they form a straight line with your torso. Keep your knees straight. As you inhale, slowly lower your legs to the starting position. Talk with your physician before starting any new exercise program. This is especially true if you are diagnosed with, or at risk of, osteoporosis. Stretching and exercises designed to elongate the back muscles should create a slight pull in the back muscles. But you should not experience pain. If you do, discontinue the exercise. Talk with your physician about the addition of weights to increase muscle strength in your core and back. National Osteoporosis Foundation: What is Osteoporosis? Can Stretching Your Back Make You Grow? 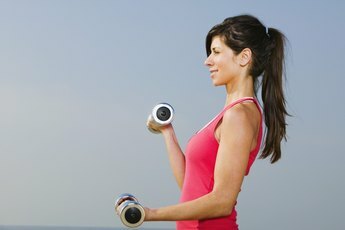 Does Stretching Your Arms Make You Taller?